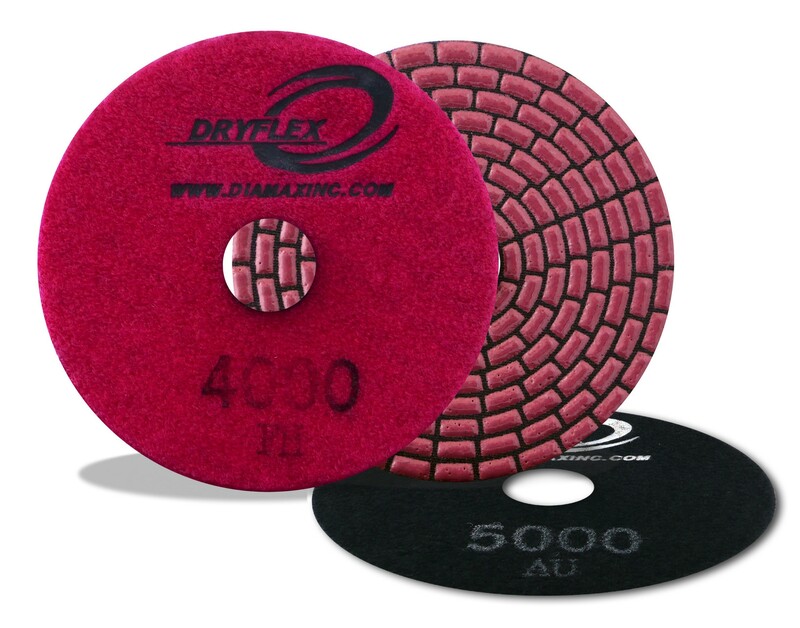 Dry stone polishing pads have diamonds and other abrasives embedded in a heat-resistant resin, allowing them to be used without water. Running them against abrasive surfaces such as granite and concrete slowly remove pad material which exposes fresh diamonds. The diamond content and makeup of the resin matrix is what determines speed, longevity and quality of the polish that the pad can produce. 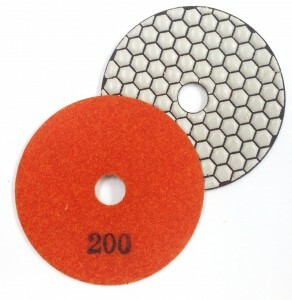 Dry polishing pads perform best on granite and harder stones; for marble and softer stones you will see resin smear (pad leaving color on stone) above about 800 grit. You can drop the RPM on your polisher to help with this, but I recommend silica carbide sand paper for polishing soft stones. The pads we tested where all run at about 2800 rpm; the speed I find seems to be best for most applications. We tested the Alpha Ceramica Dry pads, Diamax Cyclone Dryflex and Dryflex II pads, along with the MWI RockMaster Dry Pads and RockMaster E-Pads. Hands down Alpha pads work the best and last the longest. The Alpha Ceramica pads have the thickest resin layer. 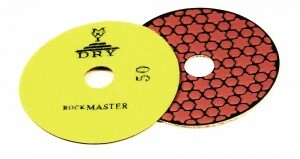 They use a unique blend of diamond and resin to create better quality results and a longer life than typical dry resin pads. Honestly, many others (including us, frankly) have tried to produce a pad that performs as well, and lasts as long as the Alpha Ceramica pads and it they just haven’t quite hit the mark. Cyclone DryFlex, a high end professional pad, are my next best pad, after the Alpha Ceramica. The RockMaster was close contender but I found that DryFlex polished a little faster. RockMaster E-pads and DryFlex II are comparable in speed and polish, but the DryFlex II seem to have little longer life. The Alpha and Dryflex pads are quite a bit more expensive than all the other pads. Our RockMaster pads perform very well against the top of the line Alpha and Diamax products, and are probably the best bang for the buck. Our pads are professional quality, significantly better performance than the cheap pads sold on Amazon (according to our customers, we confess we’ve never tried them). If you are professional using the pads every day, the Alpha or Dryflex might be worth the investment. If you are contractor who only uses pads 6 or 7 time a year RockMaster pads are a great value. If your or DIY or one time job Rockmaster E-Pads will get the job done. Keep in mind you must have variable speed grinder running around 2800 RPM. Especially with dry polishing pads, you should wear a dust mask, along with eye and ear protection. This entry was posted in Reviews on October 20, 2014 by Badsero.